Home / Bristol Motor Speedway / Hendrick Garage / Hendrick Motorsports / Lacy Keyser / Hendrick Garage: It's Bristol, Baby! Hendrick Garage: It's Bristol, Baby! 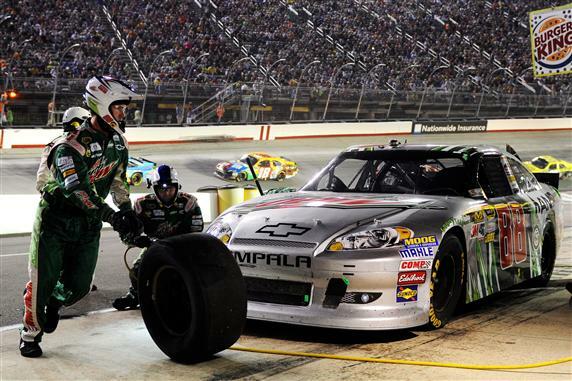 Short-track racing was in full force Saturday night at Bristol Motor Speedway. Tempers flew and even helmets went flying. As for the Hendrick Motorsports drivers, would their tempers spark or would they have a quiet Bristol race? With two races remaining until the Chase, Kasey Kahne sits in 11th position. With two wins, Kahne looks to have a wild card spot secured. As long as he can keep charging and getting top finishes, his chances of making the Chase look good. Due to rain, qualifying was cancelled and Kahne started his night 12th. Passing at Bristol can be very tricky. Could he race his way to the top without incident? On Lap 108, Kahne took the lead and kept it for a total of 41 laps. The No. 5 Chevy looked to be a winning car. However, on Lap 148 the caution came out because of David Ragan's spin and Kahne had the misfortune of slipping in the oil from Ragan’s car and hit the wall. 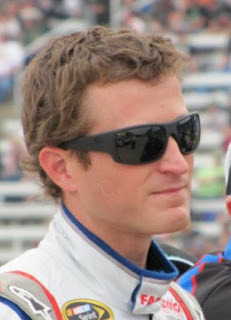 Having to pit multiple times, Kahne was lapped by the race leaders. When the caution came out on Lap 191, Kahne received the Lucky Dog pass, getting him back on the lead lap. His car slowly came back to him but just couldn’t get the speed to lead again. He ended up finishing his night ninth, turning his night around after being a lap down. Jeff Gordon sporting a unique Farmville paint scheme at Bristol. As the Chase gets closer, Jeff Gordon’s chances of making it grow dimmer. With one win at Pocono, Gordon is still a long shot to grab a wild card spot with just two races remaining until the Chase cut is decided. Since qualifying was rained out, Gordon started his night 11th based on his practice speeds, but he would quickly get his No. 24 in the top ten within the first few laps. For the remainder of the night Gordon raced in the top ten, as well as bouncing in and out of the top five. At Lap 161 Gordon’s car looked to be hooked up as he took second place from Brian Vickers. Even though his No. 24 car was in the top three, Gordon couldn’t get the speed to contend for the lead. Finishing his night third, Gordon is still trying hard to get one of the wild card spots; he is currently 15th in the point standings. After a blown engine kept him from an almost certain win, Jimmie Johnson came to Bristol hungry to forget the events of last weekend at Michigan. Starting 37th wouldn’t stop him...or would it? Johnson would have to battle his way from the back to front, which could prove to be a long night. When a caution came out on Lap 83, Johnson received some minor damage on the nose of his No. 48 when he was caught in an accident with Kurt Busch and David Ragan. On Lap 276, Johnson took the lead for the next 51 laps but in the end couldn't hold off Denny Hamlin. Even though Johnson didn't win, getting second place secured Johnson a spot in the Chase. As the Chase draws near, Dale Earnhardt Jr. looks to be making back-to-back Chase appearances but could he lock himself in at Bristol? Starting his night in 16th, Earnhardt Jr. and the No. 88 team were quickly making their move to the front. On Lap 20 he was hit with a pass-through penalty for speeding on pit road. Even with the penalty, Earnhardt Jr. was unstoppable as he charged on. He took the lead on Lap 200 for a total of 12 laps. When caution flew on Lap 347, Earnhardt Jr. pitted when pit road was closed and was sent to the tail end of the field. He ended up restarting in 23rd. 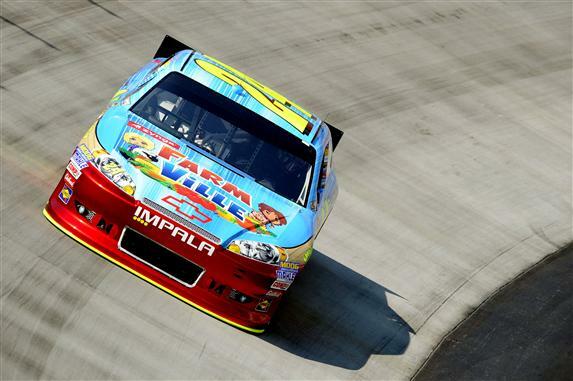 Despite two pit road penalties, Earnhardt Jr. bounced back and finished 12th. Now third in the points standings, Dale Earnhardt Jr. has clenched his spot in the Chase.